�Francis�is one of our best selling Gund bears. His black nose and paws add to his appeal and enhances his endearing nature! Francis is another of our Gund exclusive designs. We have partnered with the Gund Teddy Bear Co to create many adorable animals that you will only find at the Chelsea Teddy Bear Co. Francis is one our top sellers. His friendly face is highlighted with his black nose that trying to hide his smile. He is sure to bring a smile to you as well! 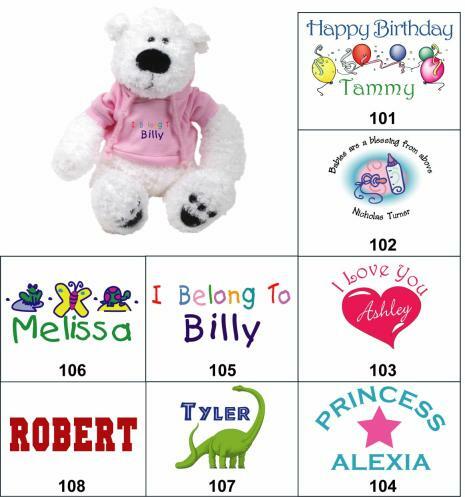 He comes with with your choice of available graphics customized by you and printed on your choice of a white or pink tee shirt or choose a sweatshirt for just $3.50 more! Francis is 5" sitting and 11" overall.